Underwater RGBW LED Light Fixture - 48W, 24VDC NEW! Our new 4 color underwater RGBW LED Light Fixture uses RGB color changing technology combined with pure white output to create billions of possible color choices in outdoor and underwater lighting applications including pool lighting, fountain lighting, waterfall lighting, spring lighting, landscape lighting, or any outdoor application. Constructed of erosion resistant stainless steel and tempered glass this fixture is built to withstand wet or submersed environments. The 50,000 lifetime hours and low voltage power consumption make this product a must have for any outdoor lighting project. Comes with 118" of 5 conductor lead wire and adjustable hinges for optimal lighting positioning. 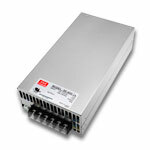 Each RGBW fixture consumes 48W of 24VDC constant voltage power. Use our RGBW color controllers or DMX control to customize the color and light intensity. Browse our variety of waterproof junction boxes and 5 pair RGBW connection wire for simple and easy installation of multiple light fixtures, see installation guide for reference. CE and RoHS approved. This is a 5 conductor 18AWG encased outdoor and waterproof wire, made for use with our RGB Extreme Strip Light and RGB + White Strip lights. 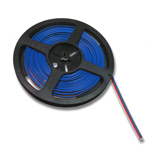 This wire can also be used for any other indoor or outdoor low voltage LED lighting projects. If used properly with our junction boxes this wire can be be fully submersible and dust concealed to supply an Control signal to as many fixtures as your junction box will allow. Wires are sold in 10ft and 50ft increments and will be shipped in one length when possible. Maximum wire lengths available is 650ft, available upon request, please call for details. Our 4 Knob RGBW LED Controller can be used to control your 4 Color RGBW LED Strip Lights, modules, or 12-24VDC constant voltage lighting fixtures. The digital display above each knob lets you see the 0-255 dimming values of your Red, Green, Blue, and White output levels. Combining all the options of each output you can create over 4 trillion different color hues and fine tune any color that you want. 37 built in color changing effects with speed and brightness adjustments can be accessed using the RF remote control. 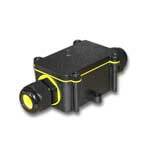 Each of the 4 color outputs can control up to 5 amps of LED lighting, or 60 watts using 12VDC, 120 watts using 24VDC. 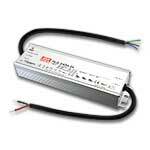 Multiply that value over the 4 channels and you can control up to 240 watts max at 12V or 480 watts max at 24V. 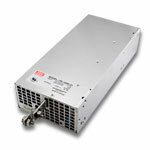 A Mean Well brand Waterproof 150W, 24VDC LED transformer / power supply recommended for use with our 24VDC Wall Washer and Strip Light Products. 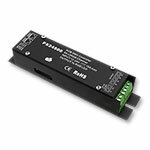 This product requires an input voltage of 100-240VAC 2.0A or 277VAC .68A; and an output voltage of 24VDC 6.3A maximum. For wet or damp locations. This product is not meant to be directly exposed to outdoor elements. 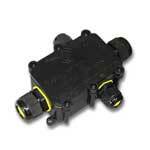 UL recognized, CE approved, IP67 waterproof.